Sen. Bernie Sanders, speaking before a Machinists’ union conference in Las Vegas, vowed to eliminate Right-to-Work laws if elected President. 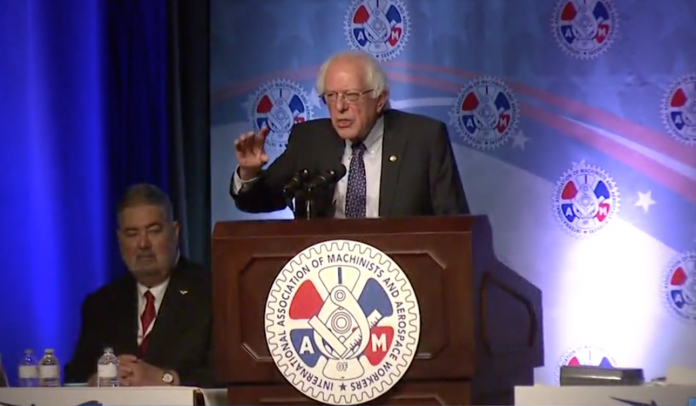 LAS VEGAS, NV—Democrat-Socialist Sen. Bernie Sanders [I-VT] was in Las Vegas on Monday speaking to the International Association of Machinists at a union conference. During his speech, Sanders stated that, if he were elected president, he would push legislation in Congress to prohibit the Right-to-Work laws. Sanders, who is currently in second place for the Democratic Party’s nomination (behind Joe Biden), has long been a proponent of ending states’ ability to enact Right-to-Work laws which forbid employers and unions negotiating contracts that make payments to unions mandatory. 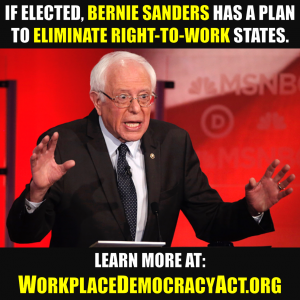 Last year, as well as years prior, Sanders introduced the misleadingly-named Workplace Democracy Act, which (among other things) would strip states of their right to enact or keep Right-to-Work laws. 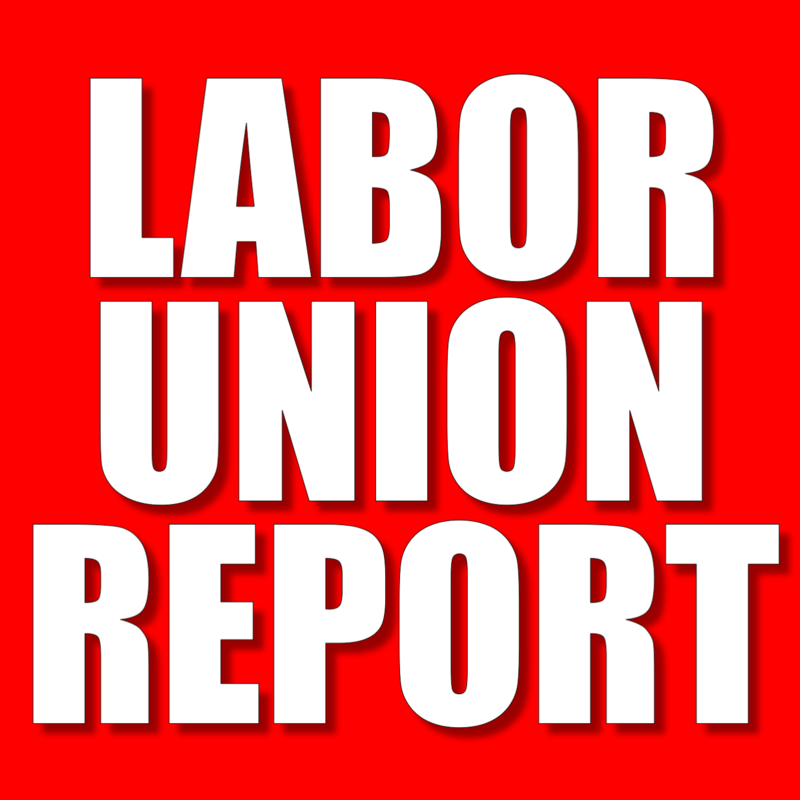 If Sanders were to get elected and the Workplace Democracy Act were to become law, unionized workers in all 50 states could be required to pay union fees. Were they to fail to pay union fees, they could be fired from their jobs. 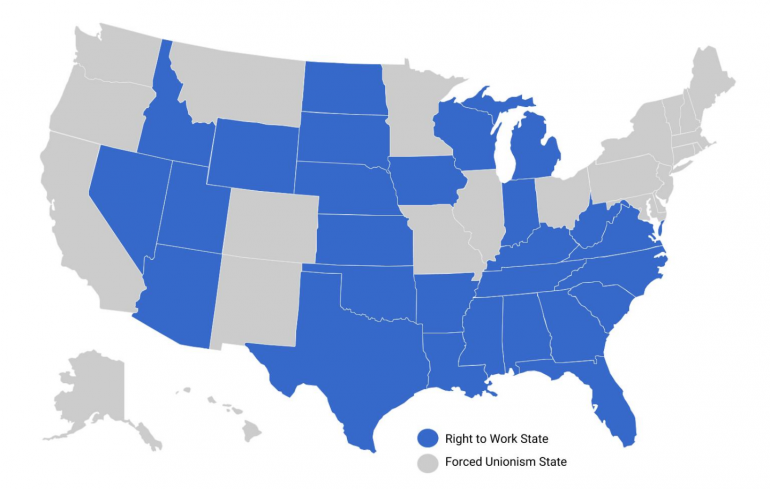 Currently, there are 27 Right-to-Work states that forbid workers from being fired for not paying union fees.